Santomè is blossomed in Roncade in the province of Treviso, “the Garden of Venice”. 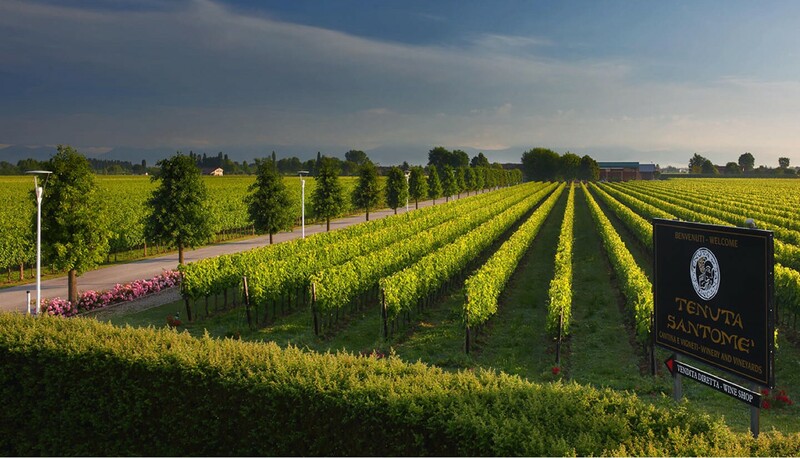 The main aim of Santomè is producing their wines only with their own 75 hectare vineyard grapes, to guarantee both authenticity and provenance and the best expression of Venetian terroir. The winery collects in itself the entire production chain. It is possible to buy the wines produced, visit the winery and participate in guided tastings in the equipped tasting room. Santomè offers the possibility to organize conferences, meetings, round tables and team building immersed in estate’s vineyards. Our wines are currently not available in Liquor Boards, but you can easily buy them through our wine agent. Please, contact us and receive your Santomè directly at your home. We produce our wines solely and exclusively with grapes grown on our estate, in order to ensure full control over the entire production chain and to guarantee a consistent level of quality. The welcome and hospitality are rounded up by the possibility of staying in the 10 elegant bed and breakfast rooms inside the renewed ancient farmhouse contiguous to the winery. It was our dream holiday. Peaceful and picturesque wineyards, charming and well kept gardens, nice designed rooms spiced up with delicious breakfast and cup of delightful capuccino. Santome property is perfect starting point for sightseeing and tourist one-day trips around Veneto region, and particularly Venezia by train. Kind owners and stuff will be there for you to give any advise whatever you are interested in (tourist and historic points, shopping spots etc). For families with kids there is large garden on the fresh air where you can leave your kids free to play around. Final touch of the holiday is an evening spent in the backyard drinking typical, amazing Prosecco Valdobbiadene..
We will definitely come back to Tenuta Santome! First and foremost William, Alan and Armando are wonderful hosts whose passion for what they do reverberates through every sinew. The estate is a wonderful place to relax, learn about the wines and to use as a base to discover the surrounding area which for us included Treviso, the Conegliano area, Valdobbiadene, Asolo and, of course Venice. The rooms were very relaxing and quiet and breakfast catered for every need. In fact the only problem is that you will never want to leave! A perfect blend of atmosphere, fine wines (especially the Prosecco), and gracious hosts, William, Alan and their family). A gem of a location that must be experienced in person in order to appreciate. The bed and breakfast service is truly remarkable, in a restored farmhouse that provides an intimate and unforgettable experience. I highly recommend William Spinazzè and his Tenuta Santome to any wine lovers. Wonderful. A credit to its owners. Peaceful and picturesque wineyards, charming and well kept gardens, nice designed rooms spiced up with delicious breakfast and cup of delightful coffee. Santome property is perfect starting point for sightseeing and tourist three-days trips around Venice and Treviso. Lovely owners and the stuff will be there for you to give any advise whatever you are interested in tourist ,historic points, shopping spots etc. Their hospitality and kindness is hard to find in hospitality nowadays. Final touch of this trip is drinking their own wine in the backyard . They produce outstanding wines , and the prosecco superiore is just amazing . i will defiantly come back for another stay.